The straight shackle design makes the lock slightly less versatile but invariably more secure against force attacks. A tough plastic case gives this lock added resistance to the weather and impacts. 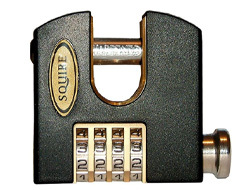 The lock uses a 4 dial combination resettable to your own code. The straight shackled or shutter padlock can be used in a variety of situations where a high-security padlock is needed but are ideal for security shutters, gates and barriers. 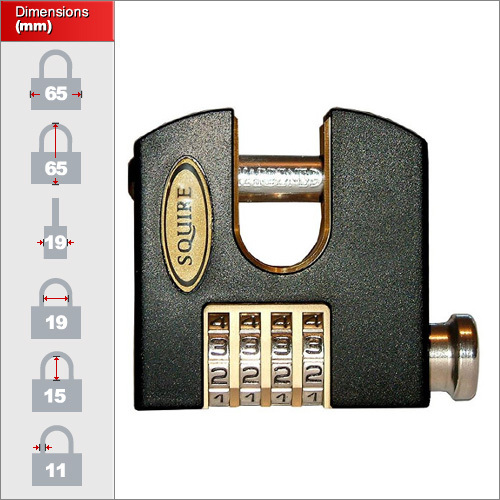 For more information on the types and designs of padlocks please see our advice section. The shackle is made from solid brass and an added plastic casing. These are part of the Squire Stronghold range and designed to withstand the toughest of attacks and work reliably in outdoor conditions.